Chukiess & Whackboi & Boris Foong. *Pre-Sale tickets available for purchase AUGUST 30th (Night) ONWARDS. At Zouk KL office from Mon-Fri 10am-7pm (exp Public Holiday) // At Zouk KL front office ticketing counter from 10pm till late every day. Over the last 10 years Markus Schulz has fused the individual musical identities of progressive, house & trance into his own creative, now inimitable hybrid sound. 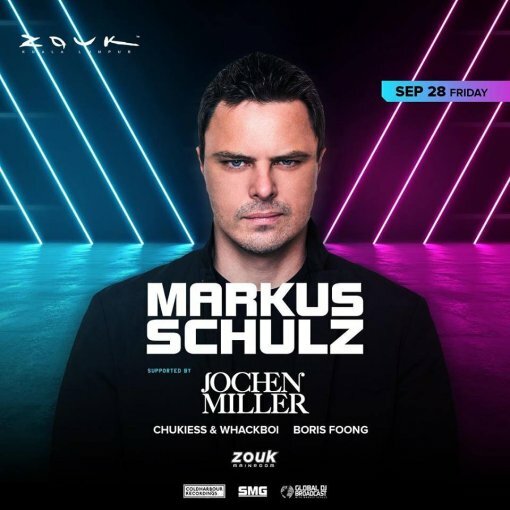 Markus Schulz has wowed his fans with his natural audience affinity, flawless key-mixing and innate tune selection, he has wowed crowds in every major metropolis. Schulz’s DJ career has run largely parallel to that of his productions. Through a unique alignment of headlining DJ sets, Armada and Coldharbour label output and his highly prominent Global DJ Broadcast radio show, he’s spearheaded a sea change revolution in the US trance scene. This success has been reflected in weekly sets played in front of many tens of thousands, a GDJB listenership up in the millions & one Beatport chart-topper after another. Following several highly ranked positions, in 2008 Schulz broke into the Top 10 of DJ Mag’s Top 100 chart. He’s remained there for the last four straight years (polling #9 in 2011) and now stands as the busiest international DJ playing out of the United States. As highly as Jochen Miller is regarded for his unrelenting ability to stay on the pulse od electronic music, the Dutch DJ and producer adopted a particular style early on in his career. In evolving with and integrating his own translation of “dance music,” Miller has channeled a sound that dabbles in the tech, trance, and progressive soundscapes since his humble beginnings under the alias, “DJ Jochen.” What lay the foundation as a hobby in his teens quickly snowballed into a fruitful career that has landed Miller time slots at grandiose festivals such as Ultra, Tomorrowland, and Electric Daisy Carnival, to name a few. Having since earned international acclaim and changed his alias from DJ Jochen to a more sophisticated Jochen Miller in 2003, the luminary has been endorsed by some of the industry’s biggest players including Armin van Buuren, Tiesto, David Guetta, and Hardwell. As time foes by, this talented individual has blossomed into a more cultured and innovative performer. At a time where electronic dance music has become more widespread and versatile than ever before, it comes as no surprise that Jochen Miller continues to deliver an impressive array of original productions and remixes. We look forward in seeing what Jochen Miller is able to bring to the table in the near future. PLAY it LOUDER with VINAI!